The First Christian Church of Murray, Kentucky is a caring, ministering, and loving congregation with deep roots in our community. Our congregation was formed in 1844 and is on the National Historic Register. We are of the Protestant tradition and we practice adult paptism by immersion. We celebrate the Lord's work on the cross by taking communion each time we worship. Still, we have a unique identity as a congregation. Below are four statements that try to defineour place in the Body of Christ. We believe that "In Christ" there are no divisions, so woman and man share leadership. We believe in each other's responsibility to interpret God's word, so we study the Bible. We believe that the Lord's Supper is to unite us, so all who believe in Jesus as the Christ are welcome. We believe in the church universal, so we receive members from other congregations without requiring baptism. 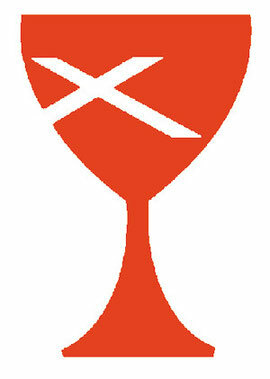 The red chalice, bearing the "x-shaped" cross of St. Andrew symbolizes the centrality of the Lord's Supper to a Disciple's life. St. Andrew has been identified with the laity and evangelism, prominent emphases of the Disciples over the years. The red color of the chalice signifies vitality, spirit, and sacrifice.